With over 20 years of experience, First Priority cabinet systems are constructed from the finest materials and workmanship in the industry. Many smaller competitors and fly by night operations claim to make First Priority style cabinets, but only a true First Priority cabinet can give you the assurance of quality and resilience when you need it most. With over 20 years experience, First Priority cabinet systems are constructed from the finest materials and workmanship in the industry. Many smaller competitors and fly by night operations claim to make First Priority style cabinets, but only a true First Priority cabinet can give you the assurance of quality and resilience when you need it most. Still not convinced? This analysis and comparison will educate you on our quality manufacturing techniques and the robust materials that we use based on our 20 years of manufacturing custom cabinet systems for emergency service vehicles. MDO Plywood: The special MDO (Medium Density Overlay) plywood used in First Priority cabinets is the highest quality and most expensive plywood on the market. MDO plywood is actually better than marine plywood designed for the high quality cabinet industry and for accepting the laminating process the best. We have had sample pieces in a container of water for 2 years and show no deterioration.The particle and MDF board used by competitors is manufactured from wood particles, dust and glue particle board is twice as heavy, vibrations will weaken all seams and moisture will kill it within days. MDF (Medium Density Fiberboard) is manufactured from wood fibers glued together under pressure and contains urea formaldehyde. Unless all surfaces are painted well or laminated, not carpeted the material will always emit fumes and be a health hazard. Heavy duty 1/8” thick PVC bumper strip for edges: The heavy duty 1/8” thick PVC bumper strip used on First Priority cabinets is installed into a machined slot on the edge of the wood and will resist bangs and bumps for many years without showing wear or damage. If replacement is needed the material is available by the foot and is installed with a hammer and utility knife. Competitors often use aluminum to trim edges but will show wear and damage easily. Another issue is trim must be cut, mitered and screwed into place. If the screws loosen the molding will catch on equipment and can be torn off or damage the equipment or personnel. Finishes: Depending on the use of the cabinet all wood in First Priority cabinets is laminated with Formica or similar laminate, heavy duty FRP fiberglass panels, carpet or commercial floor coverings to protect the cabinet from the elements and temperature changes. The painted or coated finishes used by competitors, once dented, will expose the bare wood and can cause problems under the finish. Drawer slides: First Priority uses full extension slides capable of withstanding emergency service use and the vibrations subject to vehicle applications. These high quality slides have a minimum capacity of 100 to 150 pounds for small drawers and 200 to 500 pounds on drawers longer than 30”. First Priority slides offer 100% extension allowing access to the back of the drawer without interference. Many of our competitors use light duty slides or no slides at all, leaving the last 25% to 30% of the drawer hard to access. Pressure or spring catches: All latches and catches manually latch or automatically latch when closed. Hardwood faces: The HDP material used in First Priority cabinets is unbreakable, can be machined to a nice edge that will not split and offer a durable finish for many years of operation. First Priority can also offer face panels in finished hardwoods if requested and also Corian. For clear doors, First Priority uses a Polycarbonate material such as Lexan and lucite for removable drawer dividers and command board covers. When a full slide out is required First Priority offers a lightweight steel slide system that only requires 3” to 4” of height and using composite and aluminum will fabricate a compartment system to best suit your needs while being weight conscience. Utilizing full depth drawers up to 72” deep allows accessibility to specific equipment by pulling For SUV applications First Priority offers dual access cabinets so you can access primary gear from the rear doors and back up or secondary equipment by folding the second split rear seat. This eliminates losing valuable storage space by adding 6” to 8” of valuable height, the weight of a steel slide unit and possible vibrations and rattling while driving. out only one or two drawers and releasing the entire unit only when equipment to the rear is required. Securing the cabinet to the vehicle: Every vehicle is different and attachment is very important. Every First Priority cabinet system includes hardware and directions for the cabinet to be bolted through the vehicle floor using nylon locking hardware. For specific vehicles like the Explorer, Expedition and the Durango First Priority offers custom mounting platforms. 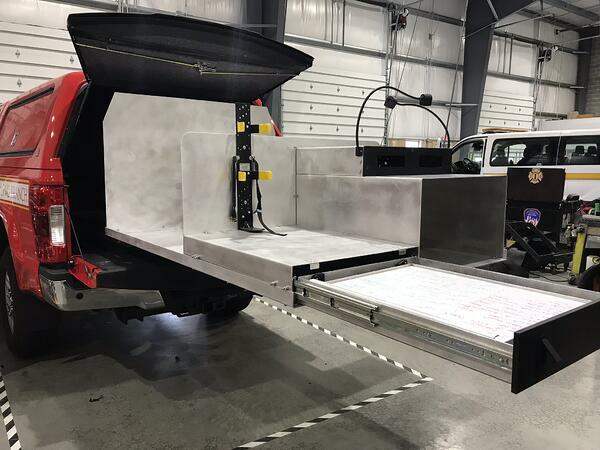 Each platform is vehicle specific and includes brackets that utilize the factory rear seat mounts for maximum strength. Steel undercarriage slides: For slide out applications of 500 pounds or greater an undercarriage slide should be used.